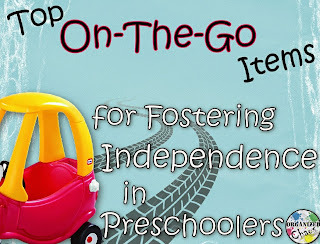 Fostering independence (without anyone getting hurt) has to be one of the most important and difficult parts of raising preschoolers. Last week I shared my favorite items to have around the house for this purpose. Today I'm back with my favorite things when we're on the go! Potty training is obviously a key feature of hanging out with preschoolers, and also one of the biggest setbacks to outings at this age. Having a travel potty for them makes such a huge difference! This one that I have is awesome because it folds up like a briefcase, making it a little less conspicuous, you use it with any gallon-size bag, and it has storage compartments on the sides! I keep spare underwear, pants, and socks, wipes, and when the girls were training I kept raisins (my treat of choice for successful potty ventures) in there as well. I keep mine in the car trunk so I always have it with me. When they were first training, they also liked to use it when we were out somewhere that had a bathroom, because it was more familiar to them. I wrote about how I organize and store my pouches in this blog post. Basically, they are pouches that you can fill with your own baby food, yogurt, smoothies, or whatever, wash and reuse. The great thing about pouches is that preschoolers don't need much help to eat them on the go- my girls can take off the top, eat, and put the top back on by themselves. A lot of other food that we take with us- granola bars, string cheese, etc- requires my help with the packaging (which is never a good thing for them). The other great thing about the reusable pouches is that the girls can choose exactly what they want in them, and help me make them! Sometimes it's just straight yogurt or applesauce, but other times we make smoothies together. They love picking out the ingredients and putting them in the blender. So these are technically snack bags or sandwich bags, but I use them for so much more than that- magnets for a game in the car, colored pencils and paper to use in the waiting room, hats and sunscreen... The great thing about these bags is that they have velcro closures so the girls can open them themselves but there's little risk of spilling, and because they are dishwasher safe I can let them handle whatever is inside without worrying about keeping the bag from getting too dirty. Since they come in fun patterns and colors, the girls can also pick which design they want- any time they can pick something is a plus! It also helps if I have several bags for each child- like a sandwich and grapes, or paper and pencils- because I can color-code the bags and tell them that "all the blue bags are yours" and they can find their own things. There are a gazillion different types out there, but putting the kids in charge of (at least some of) their own stuff is a great way to develop their independence! My girls usually have a water bottle, a small toy or book, and maybe a snack when we go out. I have recently started giving them a small grocery list of their own when we go grocery shopping together, and I put 2-3 items on each of their pieces of paper. I've seen people who have lists with photographs of the items for pre-readers- I don't go that far. My girls can't read yet but they know starting sounds so I usually tell them what is on their list and they can remember based on the first letter of the word after that. They are responsible for finding and remembering those items at the store. I usually pick things that aren't essential to my weekly meal plan, and if they forget their items, we will go home without them. They take more pride in it when they know I am actually counting on them for their items, not just pretending! 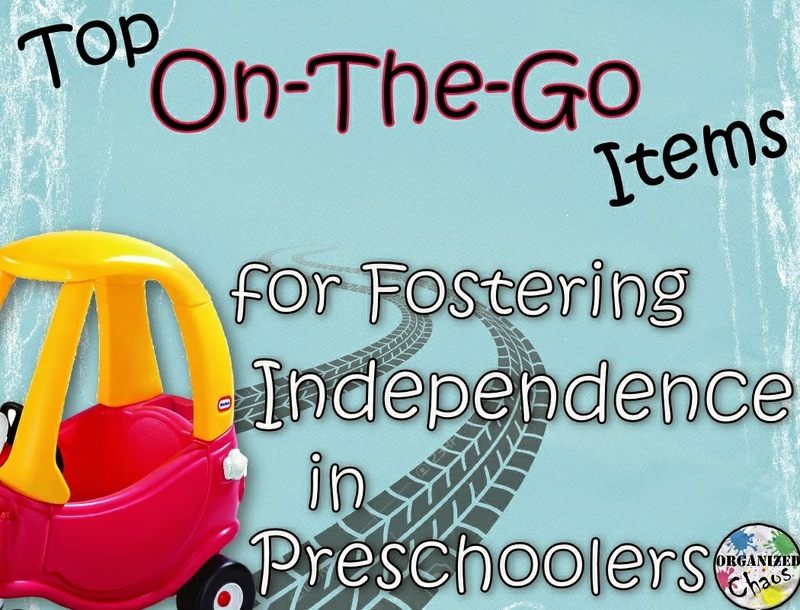 What are your favorite items for fostering independence when you're on the go? Share your thoughts in the comments below! What great ideas! Love the reusable Velcro snack bag. Pinning from Blogger Brags. I use those pouches for everything! I have a friend who made her own- she just sewed them and stuck some velcro on the closure.